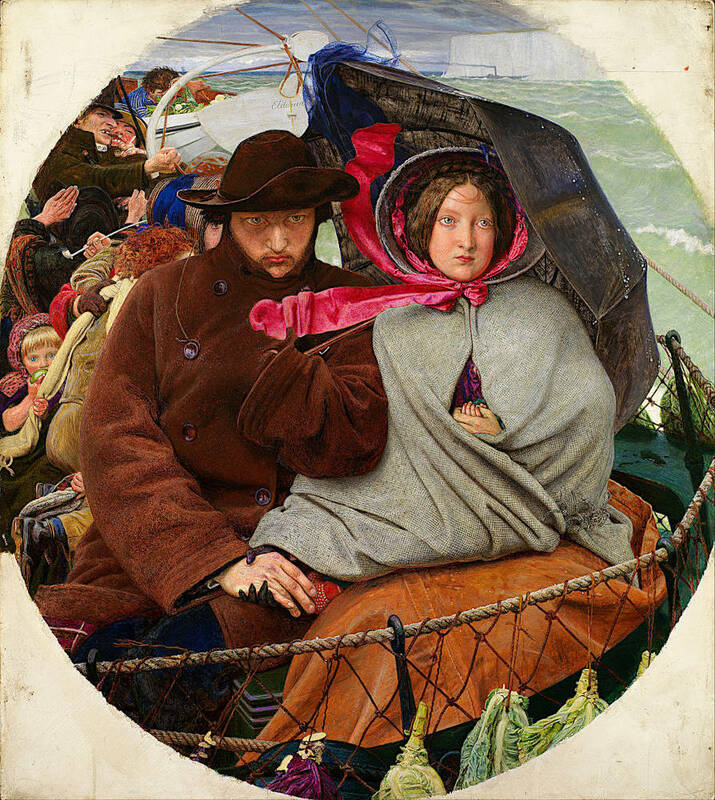 Ford Madox Brown has painted a young couple on board a ship, emigrating along with others, during the peak of the emigration movement in the 1840s and early 1850s. The woman has an infant wrapped in her grey hooded cape, and holds the baby's hand as the ship embarks on the long voyage. She grasps her husband's hand too, while that rests on the baby's little foot in its patterned sock. It is a poignant scene especially as the woman looks so sad, and the man so grim. Other passengers, glimpsed behind this family unit, seem to come from a lower class, and are certainly less sensitive and refined. They seem not to care about leaving England. On the contrary, one man, apparently engaged in horseplay, shakes his fist at it. Another smokes a long-stemmed pipe, while a little girl munches an apple. In front of the main figures hang vegetables, provisions for the long voyage, and a little boat at the rear contains further supplies. The educated are bound to their country by closer ties than the illiterate, whose chief consideration is food and physical comfort. I have therefore, in order to present the parting scene in its fullest tragic development, singled out a couple from the middle classes, high enough, through education and refinement, to appreciate all they are now giving up, and yet dignified enough in means to have to put up with the discomforts and humiliations incident to a vessel "all one class." The husband broods bitterly over blighted hopes, and severance from all he has been striving for. The young wife's grief is of a less cantankerous sort, probably confined to the sorrow of parting with a few friends of early years. The circle of her love moves with her. The husband is shielding his wife from the sea spray with an umbrella. Next them, in the background, an honest family of the greengrocer kind, father (mother lost), eldest daughter and younger children, make the best of things with tobacco-pipe and apples, &c., &c. Still further back, a reprobate shakes his fist with curses at the land of his birth, as though that were answerable for his want of success; his old mother reproves him for his foul-mouthed profanity, while a boon companion, with flushed countenance, and got up in nautical togs for the voyage, signifies drunken approbation. The cabbages slung round the stern of the vessel indicate, to the practised eye, a lengthy voyage; but for this their introduction would be objectless. A cabin-boy, too used to "laving his native land" to see occasion for much sentiment in it, is selecting vegetables for the dinner out of a boatful. (qtd. in Ford 100). However, as so often in his work, there is relief from the predominant atmosphere not only in the earthier details (vegetables, fist-shaking) but also in the woman's fluttering ribbons, for which he used that brilliant shade of magenta that he once said, in a parlour game, was his favourite colour (see Thirlwell 24, 29-30. Click on Julian Treuherz's front cover to see a larger picture showing the colours, and also to read a review of the book). Ford, Ford Madox. Ford Madox Brown: A Record of His Life and Work. London: Longmans, 1896. Internet Archive. Web. 4 May 2012. Thirlwell, Angela. "The Game of Life: Ford Madox Brown — A Character Study." 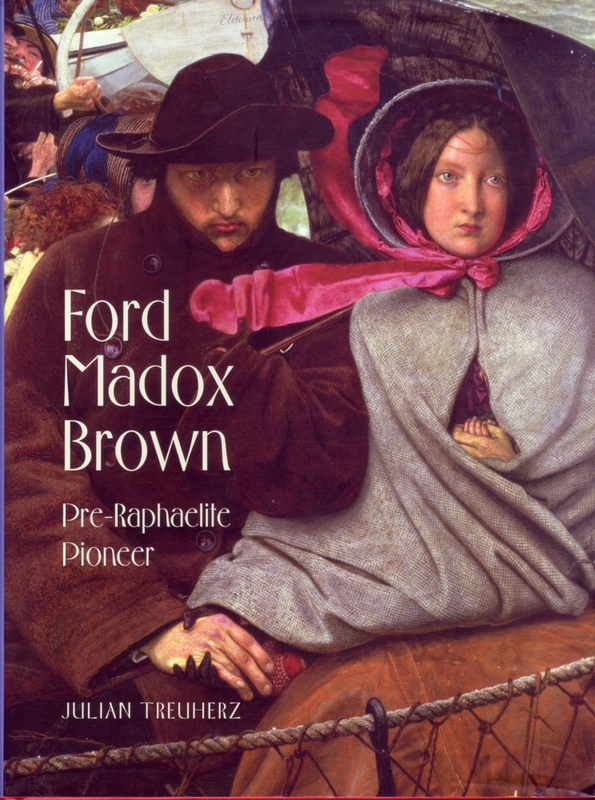 Ford Madox Brown: Pre-Raphaelite Pioneer, by Julian Treuherz, with contributions by Kenneth Bendiner and Angela Thirlwell. London: Philip Wilson, 2011. 23-35. Print.